Tomorrow is the first day of all day meetings pre-planning. I'm so sad that summer is over!! I spent the afternoon with Hubs at the pool- desperately trying to savor every last second! I was trying not to think about the massive to do list...sadly, it's too long to not think about. Do you get B2S jitters? It's so crazy- but I always toss and turn the night before school starts! A Turn to Learn is hosting a cute linky! Who else is headed back tomorrow? Are you sure I didn't write this??? Those would be my exact answers! My kiddos came last Tuesday so I'm off to bed early tonight!! Have a great day tomorrow! Best of luck to you as you begin your new year! Don't worry, the kids will be too excited to notice the decorations! I definitely need to remember to go home at a decent time also! I either go home right away or end up there until all hours of the night with a bunch of missed calls from my husband when I finally check my cell phone... eek! Good luck tomorrow! Good luck today! I love that you get to teach your same group of kids! Thats what I loved about teaching kindergarten. I got to have my JKs again in SK. I hope that you had a great first day back! Thanks for sharing your jitters. I looped with most of my first graders to second grade last year and it was a great experience! I hope you find it to be that way for you as well. Good luck with the start of the school year. My kiddos start tomorrow as well!!! I looped last year from K to 1st and thought it was a really great experience. I didn't feel like I knew what I was doing half the time :) but I learned a lot! Made It Monday + Odds & Ends in photos! 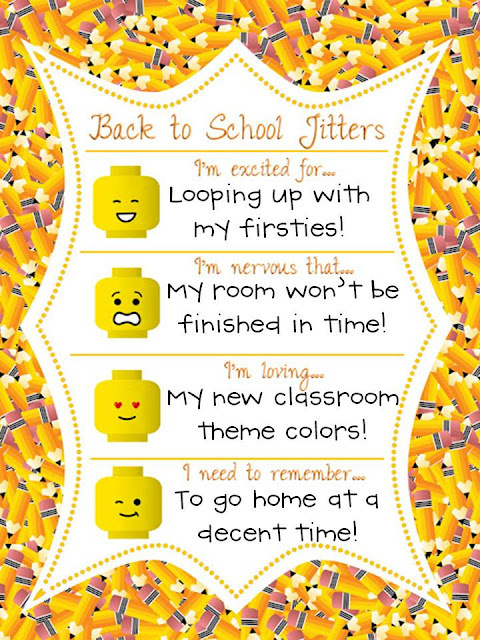 Meet Your Teacher ideas and a clock FREEBIE!